Will the world end in 2012? No, it won't. Will there be a major cataclysm in 2012? Quite possibly. 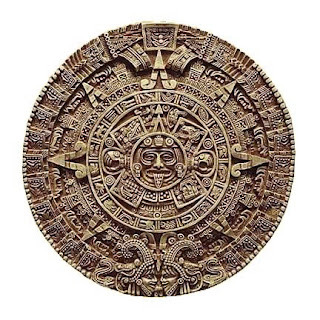 Although this book concentrates on a potential global catastrophe at a random date within our immediate future, the ancient Mayan Long Count calendar is a powerful argument for that date being Dec 21, 2012. The Maya civilisation inhabited a region encompassing southern Mexico, Guatemala, El Salvador, Belize & western Honduras, and flourished between the third and tenth centuries AD, but by 1200 AD their society had collapsed for reasons we can only guess at. When the Spanish conquistadors arrived, descendants still occupied the area, and still spoke the Mayan language, but were unaware of the cities their forefathers had created. It wasn't until the late 18th century that explorers first investigated the dense Guatemalan rainforest and came across plazas, monoliths, temples and pyramids, each decorated with pictures and hieroglyphs. The ancient Maya had been keeping historical records - using a script which mixed ideographic and phonetic elements. Some of their writing still exists on stelae (stone monuments) that recount civil events and record their calendric and astronomical knowledge. Diego de Landa was a Spanish priest who visited Mexico on a charitable mission, became the Franciscan provincial of Yucatán in 1561 and is infamous for his destruction of priceless Maya documents and artefacts. Although Landa was very interested in the Mayan culture, he abhorred certain aspects of their practices, particularly human sacrifice. In July 1562, when evidence of human sacrifice was found in a cave containing sacred Maya statues, a bout of religious self-righteousness saw Landa order the destruction of five thousand idols. He decided that their books were also the devil's work and saw to it that they were burned, with only three books surviving. Consequently the majority of Mayan knowledge and history was lost. Yet despite his actions, we are also indebted to Landa for his acute and intelligent opus on Mayan life and religion, Relación de las cosas de Yucatán (1566), which remains the classical text on Mayan civilisation. This book, which was not printed until 1864, provided a phonetic alphabet that made it possible to decipher roughly one-third of the remaining Mayan hieroglyphs. The most important of the surviving books was what is now called the Dresden Codex, named after the city where it was lodged. It is a strange book, inscribed with hieroglyphs, which no one understood until 1880. At that time Ernst FØrstemann, a German scholar who worked at the same Dresden library, managed to crack the code of the Mayan calendar making it possible for other academics to translate the many dated inscriptions found on buildings, stelae and other ancient Mayan artefacts. Other information we have today has been gleaned from the Popol Vuh and Chilam Balam - books written just after the Spanish arrived. The knowledge found in these books and codices, combined with the uncovering of mysterious pyramids, demonstrate that the Maya had knowledge to rival the Greeks and Egyptians. The life of the Maya revolved around the concept of time. Priests were consulted on civil, agricultural and religious matters, and their advice would be derived from readings of the sacred calendars. Time was of such importance that children were even named after the date on which they were born. Maya math uses only three symbols - a shell-shaped glyph for zero, a dot for one and a bar for five to represent units from zero to 19. For instance, the number 13 was represented as three dots and two bars. Zero was an advanced concept in those days, something that the Romans were not aware of. Yet the Maya were comfortable enough with it to use a shell as its symbol, a tangible object representing an abstract concept. The Maya also used metrical calculation and place numeration, which were very clever for a culture that didn't use the wheel! The first is the scared calendar known as the Tzolkin. It combines the numbers from 1 through 13 with a sequence of 20 day-names. It works in a similar manner to our named days of the week, and their date within each month. So you might have 5-Chikchan (like our Sunday the 5th) followed by 6-Kimi (as we would have Monday the 6th). After 260 days the same number/name combination will re-occur, and the calendar starts anew. Their use of the vigesimal (base 20) numbering system probably relates to fingers and toes, whereas the 13 nicely fits the growth phase of the moon which isn't visible when new and appears full for two days on end, thus appearing to have a 13 day growth cycle. Alternatively, the length of the Tzolkin may be related to the human gestation period of nine months (273 days). It has been suggested that 260 days is the time between a woman suspecting her pregnancy (she doesn't menstruate) and when she gives birth. The second is the agricultural calendar known as the Haab, or vague year. It consists of 18 months, each of 20 days. An addition of a five-day month (a period of apprehension and bad luck named Uayeb) gives us 365 days, an approximation of a year. This calendar's primary purpose was to keep track of the seasons, for seasonal and solar events would occur on roughly the same day of each year. The Maya were aware of the annual quarter day discrepancy, but it is not known if they ever did anything about it. It was expected that the world would end at the completion of a 52-year cycle. At this time, among the Mexica in the Valley of Mexico, all fires were extinguished, pregnant women were locked up lest they be turned into wild animals, children were pinched to keep them awake so that they would not turn into mice, and all pottery was broken in preparation for the end of the world. In the event the gods decided to grant man another 52 years of life on earth, however, a night time ceremony was held in which the populace followed the priests through the darkness over a causeway to the top of an old extinct volcano that rises abruptly from the floor of the basin of Mexico, known today as the Hill of the Star, the hill above Ixtapalapa. There, with all eyes on the stars, they awaited the passage of the Pleiades across the center of the heavens, which would announce the continuation of the world for another 52 years. When the precise moment came, a victim was quickly sacrificed by making a single gash in his chest and extracting the still palpitating heart. In the gory cavity the priests, with a fire drill, kindled a new flame that was quickly carried by torches across the lake to the temple in Tenochititlan, and from there to all temples and villages around the lake. This was known as the New Fire Ceremony among the Mexica, and in some way this same completion and renewal of each 52-year cycle was recognized by all Mesoamericans." A Mayan date utilises three calendars. The third calendar, known as the "long count", is a continuous record of days that starts over every 5000 years or so. The current Long Count began in 3114 BC. And it will end very soon. 4 Zotz is the Haab date. 3 Cimi is the Tzolkin date. 12.18.16.2.6 is the Long Count date. The First Age began with the creation of the Earth, and it had upon it vegetation and living beings. Unfortunately, because they lacked speech, the birds and animals were unable to pay homage to the gods and were destroyed. In the Second and Third Ages the gods created humans of mud and then wood, but these also failed to please and were wiped out. We are currently in the Fourth and Final Age, the age of the modern, fully functional human. Is it possible that these Ages referred to evolutionary change? If they did, then what might occur when the current age finishes on December 21, 2012?